We present a protocol for distributed adaptive transmit beamforming in networks of wireless connected nodes and show that the performance of this protocol is sensitive to environmental changes. However, we show that it is possible to tune parameters of the protocol in order to compensate for these environmental aspects. 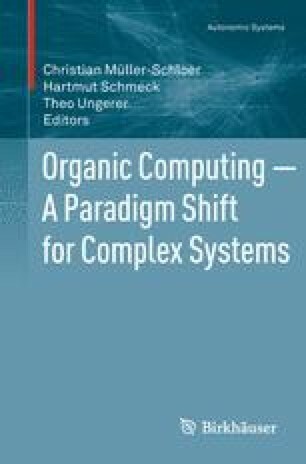 We extend the protocol by Organic Computing principles to realise an adaptive, emergent behaviour so that optimum parameter settings for distributed environments are learned. For this organic behaviour, knowledge about the actual situation is required. To establish this situation awareness we present a novel approach to sense situations based exclusively on RF-channel measurements. We show that an awareness of the presence, position, count and even activity of persons can be established based on simple features from the RF-channel only. This situation awareness completes our proposal of an emergent protocol for collaborative transmission of distributed devices.